JS Air Curtains is to offer a 45 minute webinar that will provide online training to consultants, contractors and facilities managers on air curtain system design, selection, controls and potential applications. The live online session will take place at 10:30am on 19 June and will enable attendees to better understand the potential for energy savings and improved comfort that air curtains offer. 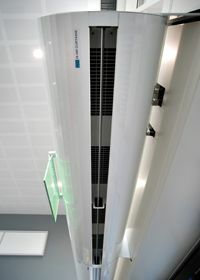 Delivered by Nathan Duce, area sales manager for JS Air Curtains, the webinar will include advice on how an air curtain can be used across public, industrial and cold storage applications, mounting options for both performance and aesthetic design, and how best to control an air curtain to achieve a building's environmental and energy objectives. To register for the online event and for more information visit www.jsaircurtains.com.